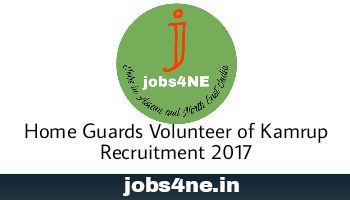 Home Guards volunteer of Kamrup District Recruitment for various Agencies in Kamrup District: Last Date 30-06-2017 - Jobs4NE : Jobs in Assam and North East India. Application are hereby invited from the intending Home Guards volunteer of Kamrup District (Kamrup Rural and Kamrup Metro) for engagement under various Agencies in Kamrup District. Eligiblity and other condition applicable for Home Guards volunteer are as per rules laid down in Assam Home Guards (Amendment) Rules, 2015. Starting Date for submission of application: 01-06-2017. Last date of submission of application: 30-06-2017. Total Number of post: 190. (ii) Home Guards volunteer certificate from Kamrup District. (mandatory willingness certificate obtained in 2015-16 from the competent authority for a period of three years) as per Assam Home Guards (Amendment) Rules,2015. (3) Extracurricular activity certificate if any. (4) any skill development certificate. Age limit: 55 years maximum (preferably below 35 years). Wages: (i) Rs. 235/- per day for Basic trained Home Guards volunteer. (ii) Rs. 250/- per day for Advance trained Home Guards volunteer. Selection Process: Home Guards volunteer will be shortlisted on the basis of First come First serve for the above mentioned tentative vacant post.